I was recently part of a great discussion. The subject was What is one thing you wish you had known when you first started working on your family history? There were so many great comments. 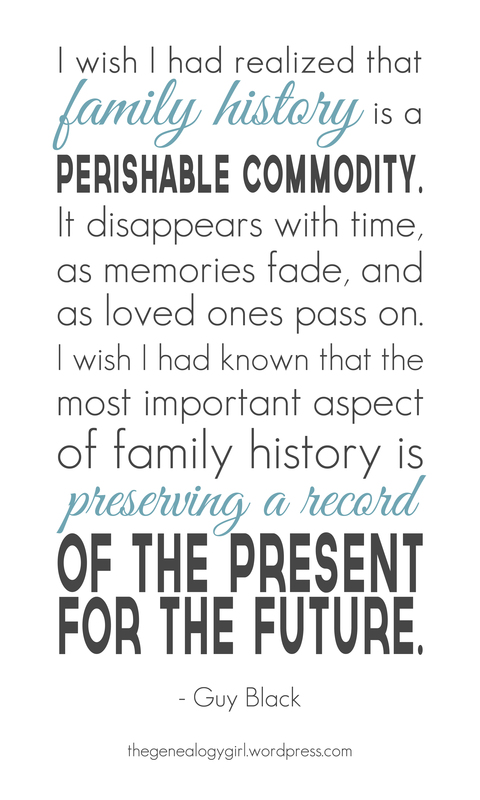 This quote sums up one of the things that I think all beginning genealogists should understand. In fact, it is something that I have been focusing on heavily lately. Honestly, sometimes I miss the Quebec and Scottish research I was working on earlier this year. But whenever I feel that tug, I remind myself of this idea and I dig back in to preserving as much as I can from my oldest living relatives. It has been a pretty cool experience. What is one thing you wish you had known when you first started working on your family history? Next postPhotograph Showcase: Which Grandfather Hyde? I’m not so much as thinking of what I had known, but more what I wish I had done which was to ask more questions of my grandmother while she was still alive, but it is doubtful whether she would have told me much. When I first started doing it I was living in the Scottish Borders, far away from any place my ancestors had ever lived so I was relying on what I could find online at the time, which was only just beginning to flourish. I really enjoyed learning as I went about the records I could use and how to research well. I made plenty of mistakes in that first couple of years, went down completely wrong avenues and had to start again on some lines. I suppose it would have been good to know that it is OK to make mistakes. I often see people copying lots of information from other peoples trees and never checking any of it, pleased that they have found a whole branch and not had to do any work for it. But sadly only one person has to make a mistake and then it is copied onto so many trees. I do try to be polite when I question people or point out a potential flaw in order to help them get a more accurate tree, it’s not worth getting shirty with people over it, but I am met with mixed responses. Some people are so very angry to have made a mistake, some are gracious and thankful at the opportunity to find the correct ancestor. I once had one person get really very cross when I sent them a message asking them to take off the branch that had all of my family on because it wasn’t correct and even went so far as to say that they hoped that if they ever heard from me again (which they didn’t want) that I never used an exclamation mark again…. So I guess if I could give anyone advice, as a beginner, it would be to check the information you find, not be so accepting and that it isn’t the end of the world if you make a mistake. All great points Alex, thanks. From my meeting those were some of the common themes as well. Ask questions of your oldest living relatives, don’t be afraid of mistakes, and be careful about those online trees. A few other points I loved were to be organized, take good notes, document your sources, and my favorite was from one woman who wasn’t actually interested in family history when she started and she shared that she wished she had known how much she was going to love it. It is amazing how absorbing it is! I think people who haven’t done it just don’t get it! I think it must be my mission in life to get people interested! I love spreading the genealogy joy! It really is a lot of fun! I agree, I even remember feeling that way myself a handful of times.